The preparation of every dessert is very important and is done properly and quickly when created by an experienced gourmet chef. 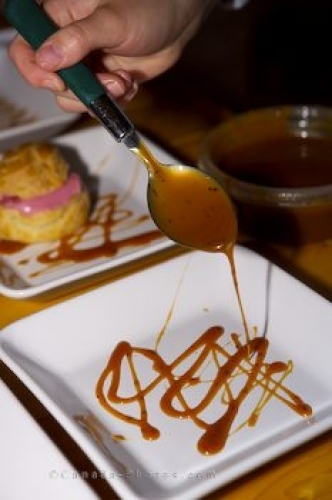 In the preparation of this dessert, the chef delicately scatters caramel across the base of each plate as the beginning to this delicious creation. Once you taste this dessert, your taste buds will go crazy and crave for another, but in reality one dessert is plenty. Dessert preparations at Rifflin'Hitch Lodge, Eagle River, Southern Labrador, Labrador, Newfoundland Labrador, Canada. Picture of a gourmet chef in the midst of the preparation of a dessert.